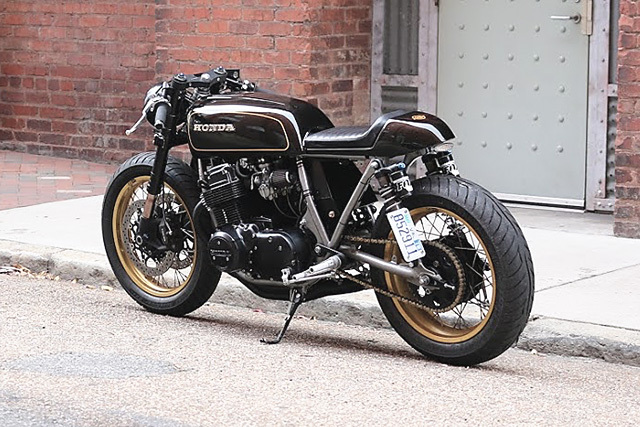 For all the attention the craziest new builds receive, the ones displayed at bike shows on spinning podiums, there is something very special about an understated bike that comes along that just does everything right. 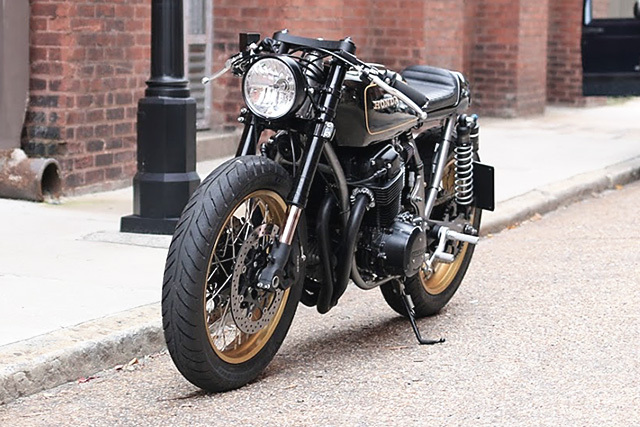 So it should come as no surprise that such a machine comes from Richmond, Virginia’s kings of cool, clean and celerity, Cognito Moto. 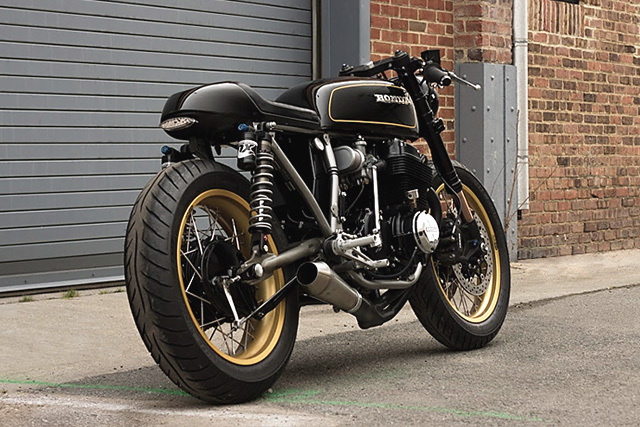 “We wanted to do something that spoke to the weekend bike builders out there that want a badass bike without all the headaches,” explains Cognito’s Devin Henriques. 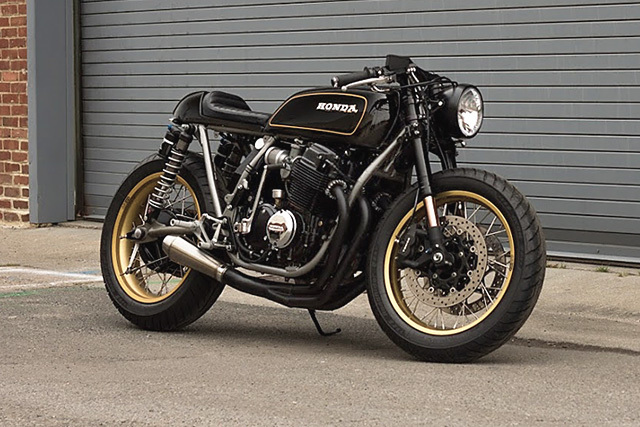 So it is that this 1974 Honda CB750 proves nothing serves a weekend biker as well as a machine that will carve the canyons, hammer in a straight line, look the goods parked up and importantly starts with the first hit of the button. 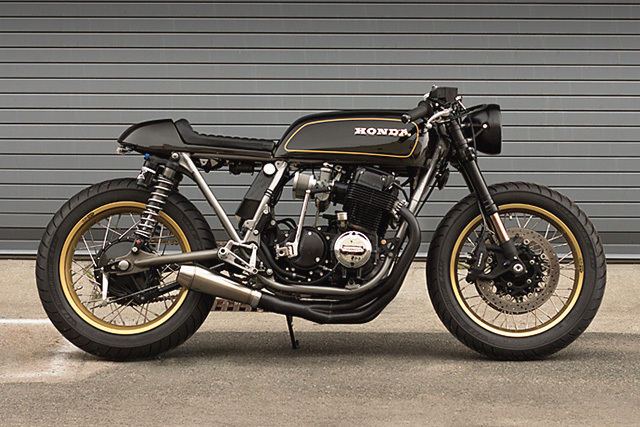 With just a hand-me-down frame and motor it was all the boys needed to get the build underway and they started in the area they are perhaps most well known; their incredible fork conversions. It’s one thing to slap a set of modern USD forks onto an old frame but having the fit and finish up to factory quality is another thing all together. It’s something Cognito specialises in and this Honda now sports a set of fully adjustable Showa forks from a Suzuki GSX-R 750. Making the swap a breeze is the use of one of Cognito’s own conversion stem working in conjunction with a set of All Balls bearings. “All you need is a set of bearings with the correct inner diameter for the stem and outer diameter for the head tube”. Finishing out the conversion is one of Cognito’s most popular parts, their billet aluminium top triple clamp that would prove even more valuable later in the build. With the front end sorted the twin shock rear had to be brought into the 21st century as well and these are no ordinary upgrade. The Fox Podium RC1’s are velocity-sensitive, fully adjustable bolt-on shocks that are specifically tuned for street and café racers. They also feature low speed compression adjustability that allows the rider to tailor the suspension for comfort and performance, meaning no compromises need be made between a day on the track or a commute through the traffic. With such a mighty suspension upgrade braking is drastically improved with the Gixxer’s 310 mm twin discs and Tokico four piston calipers. 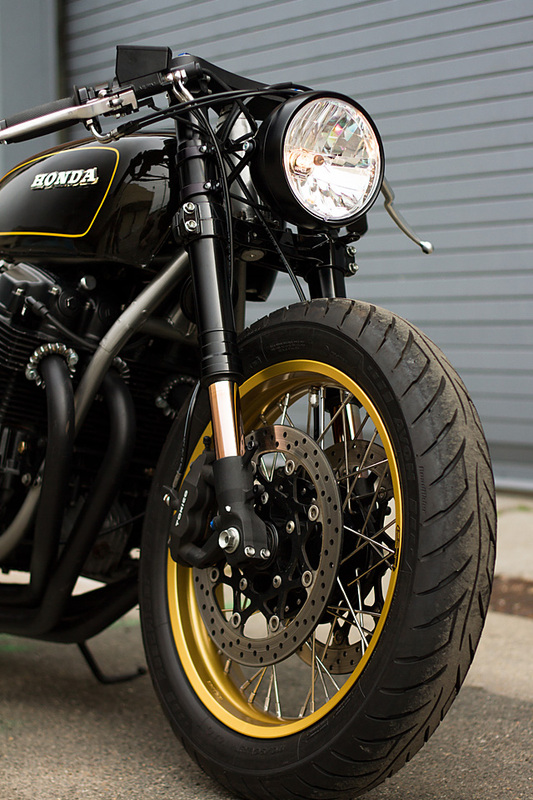 A set of custom rearsets not only look brilliant but stomping on the neatly knurled right pedal activates the refurbished rear brake for some sideways corner entry. When it came time for rolling stock the guys knew they wanted to use a spoked rim but having changed to a modern fork setup it required a little more magic from the Cognito Moto parts catalogue. Using one of their conversion hubs they laced up a Sun rim measuring 18×2.5 on the front end and wrapped it in a 110/90/18 Avon Roadrider. “This build was for a taller female rider so we went with 18s front and rear.” That rear uses a completely refurbished stock hub that has been laced with custom spokes to accept the 18×4.25 Sun rim. The rear rubber leaves a sizable foot print wearing a 150/70/18 and looks just as good going down the road with the chromed spokes giving a little extra shimmer thanks to the gold anodising on the rims. With a sweet rolling chassis in place the thing you always know about Cognito is that their body work will never let the rest of the build down. To provide contrast to what was to come the smoothed out and de-tabbed frame has been finished in a matte silver. 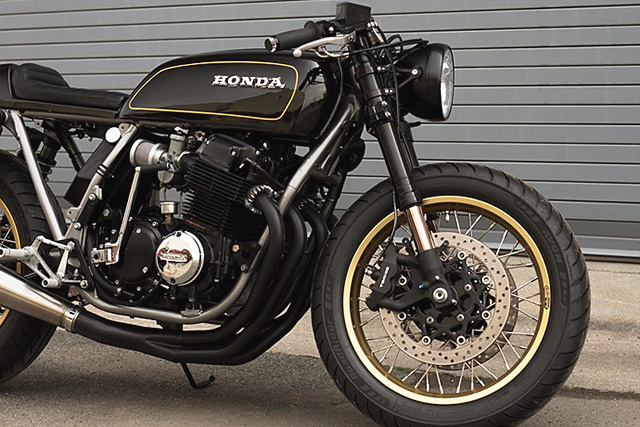 The tank itself is a CB750f item providing some meaner lines over the more traditional rounded tank that came stock in ’74. For a tail pan the guys turned to their friends over at Dust Monkey Creations and it’s topped with a neatly stitched black leather seat. The paint, like the panel work is typical Cognito, clean and perfect, the main colour Java Black pearl comes from Subaru and is used on their STI range. The accents on the tank and logo on the tail have been painted using metallic gold that matches perfectly with the anodising of the rims and it’s a look that’s crisp from front the rear. 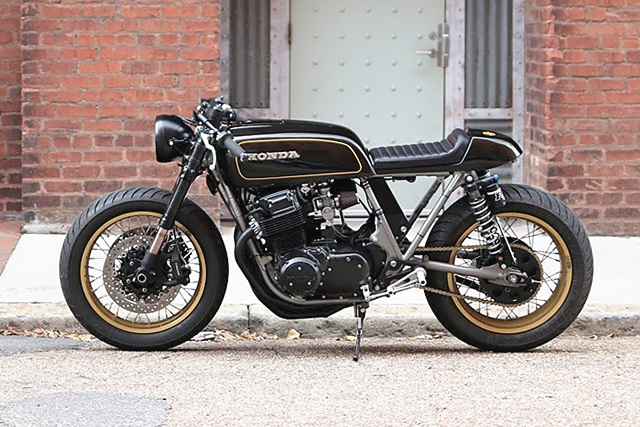 It’s from there that this build takes its name “Goldie” and of course powering this precious piece of metal is Honda’s ground braking inline four. The 736cc SOHC four pot has been treated to a complete overhaul with a full rebuild of the top and bottom end to factory specs. The original oil tank has been ditched for the frame hugging and much neater Cognito tank that ensure nothing is taken away from the bikes clean lines. Reducing weight and adding some modern performance and reliability is the addition of a Shorai 8 cell battery and electronic ignition. 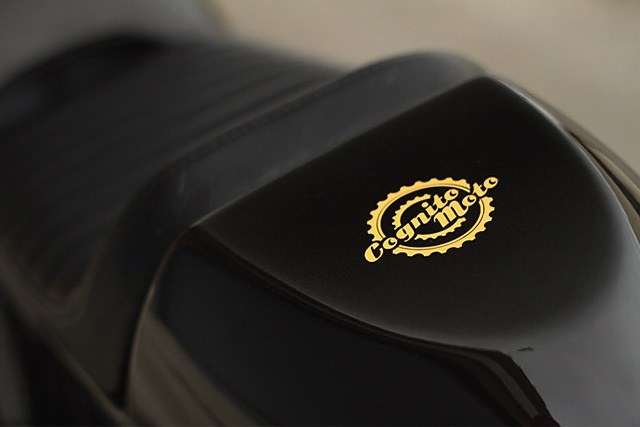 Feeding air to the bank of carbies is a relatively new product from Cognito Moto, their billet aluminium airbox. Using a Uni filter element inside you get the looks of a cool custom piece with the easy tuning of an airbox over individual custom pod filters. 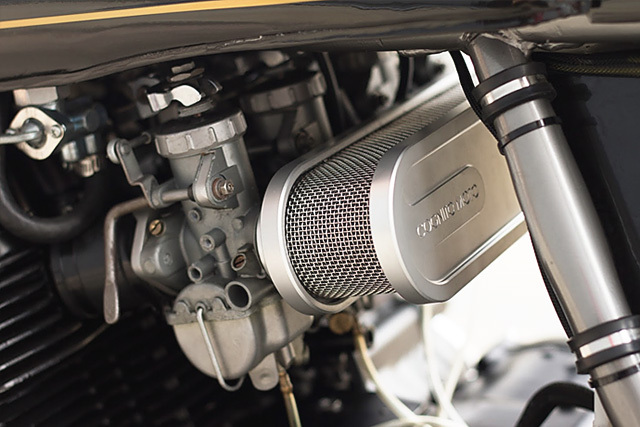 Giving some extra bark to the renewed 750 is a blacked out set of 4 into 1 pipes that finishes out in a Cone Engineering muffler. Back to that billet triple clamp, it now serves the purpose of tidying up the front end further with the instruments binned it has a Motogadget motoscope mini gauge and dummy lights neatly recessed into its upper surface. 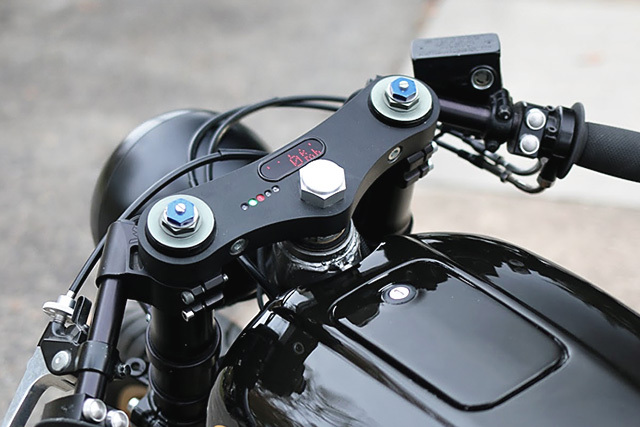 A Motogadget m-unit powers it all with a pair of m-blaze turn signals and Motogadget m-switches fitted to the high end Woodcraft clip-ons. The headlight bucket is an LSL 6.5” with an LED h4 stuffed inside and out back a clear LED tailight is neatly mounted under the tail section. Goldie once again shows off the Richmond based companies ability to constantly raise the level and build signature high level, clean bikes each and everytime. 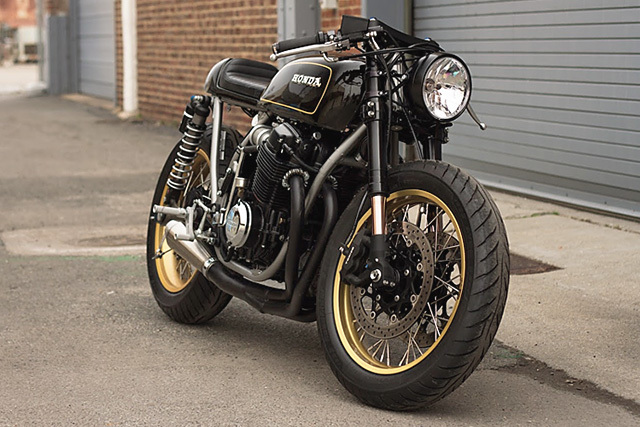 But as their builds also act as a test bed for their growing list of top quality products the aftermarket is constantly evolving with each new Cognito Moto Build bringing with it a host of must have parts.